Did The CIA Assassinate Matt Simmons For Blowing The Whistle On The BP Gulf Oil Spill? Matt Simmons, a prominent oil industry expert who lately has been very outspoken about the BP Gulf Oil Spill coverup, was found dead in his home after supposedly drowning after apparently suffering from a heart attack. But did Matt Simmons really die of a heart attack or was he assassinated? Watch: Did The CIA Assassinate Matt Simmons For Blowing The Whistle On The BP Gulf Oil Spill Coverup? Matt was very vocal on several nationwide news programs making claims that have led some people to question his sanity along with blowing the whistle on BP and Government on several issues. Matt Simmons was very well connected to other oil industry insiders and top government officials in charge of regulating the oil industry. As a result of those connections Matt has blew the whistle on several lies BP and Government where telling to the public. Matt called the claims that only 5,000 barrels of oil were leaking preposterous and instead conjectured there must be at least a minimum of 120,000 barrels of oil per leaking into the Gulf. Matt also reported that there were leaks 5 to 7 miles away which were later confirmed by a NOAA report issued by the Thomas Jefferson. Matt Simmons also revealed that NOAA ships discovered a huge underwater plume of oil at 1100 meters below the surface which could possibly cover up to 40% of the Gulf of Mexico at a time when NOAA and the federal government were publicly denying the existence of underwater plumes of oil. Matt made national headlines by stating BP would go bankrupt because they didn’t have enough money to clean up the Gulf of Mexico as well as making claims that the well integrity and pressures were so high that nothing short of a nuke could close this well. Just recently after BP capped the leaking well Matt stood by his earlier claims that the well being shown the public is a fake and BP has a second well leaking in the Gulf. The untimely death of Matt Simmons combined with his continual use of his US Government connections to blow the whistle on BP and the Government raises the question of whether Matt Simmons died of natural causes or was really assassinated. 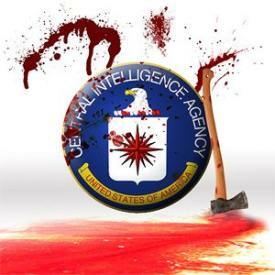 The number one suspect for assassinating Matt Simmons is the CIA because under the rule of the Obama administration the CIA now has the ability to add anyone, including American citizens, deemed as threat to national security on what is known as the kill list. Being placed on the kill list means the CIA can assassinate you anywhere in the world without even having to publicly make a complaint against you. Both the United States Government and Great Britain consider BP as critical to national security as BP supplies 80% of the US Military’s oil and BP pays millions of Government pensions in the US and Great Britain. Certainly the claims being made by Matt Simmons could have been deemed as a threat to National Security as Matt spoke of the apocalyptic consequences of the BP Gulf Oil Spill and those claims just may have earned Matt Simmons a place on the CIA kill list. So now that we have see that it was indeed possible that Matt Simmons was on the CIA kill list let us the assume that the medical examiner’s report was not faked and Matt Simmons really did die from drowning after having a heart attack. Believe it or not former CIA whistleblowers have revealed that the CIA has developed an undetectable chemical dart that dissolves completely in the skin of the target victim and causes a heart attack. Was Matt Simmons placed on the CIA kill list because he was a threat to national security? Did BP or the CIA have Matt Simmons killed? Was Matt Simmons assassinated or was Matt Simmons death really natural? Do BP Gulf Oil Spill Well Activity Reports Show BP Knew About Leak In Well Since March?